All Delta snowmaking systems utilize Delta’s Snoforce™ snowmaking management software. Developed by Delta specifically for snowmaking applications, Snoforce™ provides real-time data displays, data storage, and remote control for pumps and compressors. Daily and on demand reports, provide management with system performance and cost related information. Integral Snoforce™, a software PLC module that runs within the main body of CPU which will provides individual nozzle pressure calculations based on weather conditions, desire snow quality, system water pressure, temperature etc. The result is uniform, cost effective snowmaking, system wide. The CPU in host PC interface with Master & Local Controller and master controller control on-off, flow, pressure, temperature etc. for all machinery in the MCB automatically and interface with weather station & local controller. Local controller set in each auto hydrant module and control actuator of auto air/water valves, pressure and flow. The core functions of Delta’s snowmaking management system are performed by an Industrial PC incorporating Programmable Logic Controller(PLC). Their increasing popularity assures the best possible compatibility with the rapidly changing computer hardware and software industries. This tool is also a familiar site in many automated plants and office environments, thus assuring their acceptance by novice computer operators. 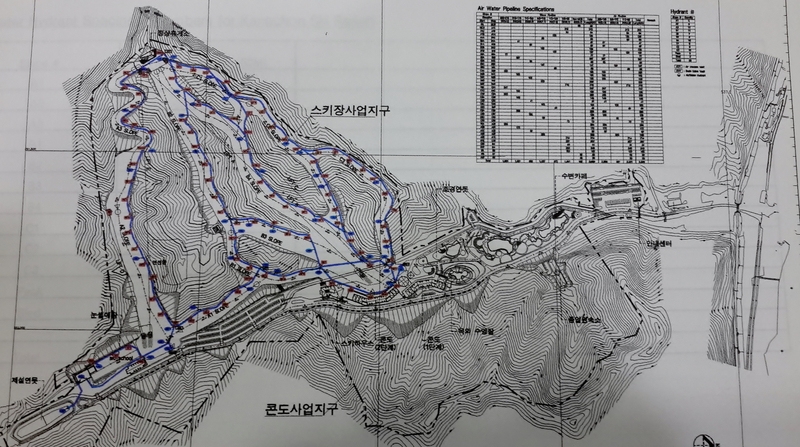 In addition to this the control system would include three weather stations, one at the MCB, one at the base elevation of the ski area and one at the summit. Each station would collect temperature and relative humidity data. The summit station would also be equipped with wind speed and direction equipment. All the resulting data would be processed by a computer located in the control room of the MCB, providing all the interactive targets required to maximize system performance. There are four factors that best describe the requirements of an effective snowmaking control system. These are Command, Control, Communications and Intelligence or C3I. Not surprisingly, the military sciences use the same factors to determine the effectiveness of their operations. To best explain the concept of C3I, it is useful to view them in a slightly different order. A well designed computer control system must be able to undertake and master all aspects of C3I. This may not necessarily require that each and every control and sensing point be integrated into the system. What is important however, is that the control system be designed and implemented in a balanced fashion which also includes balancing the costs. Delta control systems are based on a Host Computer communicating with various devices over a serial, multi-drop network (see fig.2). Each remote station can sense and control any number of digital and analog points, and can be configured with varying degrees of local processing power. Such a distributed system provides greater flexibility and control at low cost. The above configuration provides reliable, inexpensive data acquisition and control with complete flexibility. The conversion of an existing Semi-Automatic control system to a Fully Automated system can be accomplished at any time. Control of the automatic hydrants would be performed by the main control computer and communicated to automatic hydrants over a single pair of communication wire. The communication wires indicate to the computer the exact status of every automated hydrant in the system. 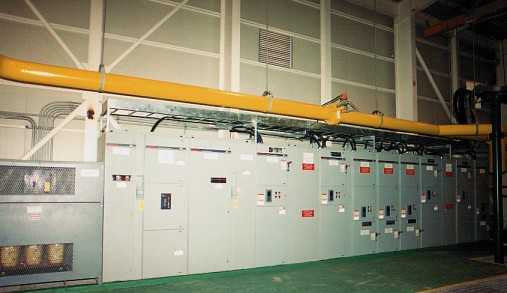 Power is provided a 110 or 220v AC circuit for each automated line which will be used for the Local PLC only. Delta automated system uses a real time control algorithm which scans each individual nozzle pressure, compares this pressure to the optimum pressure, and then adjusts the hydrant to achieve optimum performance. This method allows for infinite control and ensure that each and every nozzle is performing at 100% efficiency. Specialized valving which provides for accurate modulating control would be installed for all automatic nozzles. Valve actuator controlled pneumatically, as the result AWR constant controlled as changes of weather conditions. Also, Delta auto hydrant has additional new concept of improved device for water line self draining after snowmaking operation. This new device allows setting free locate of the tower nozzles. 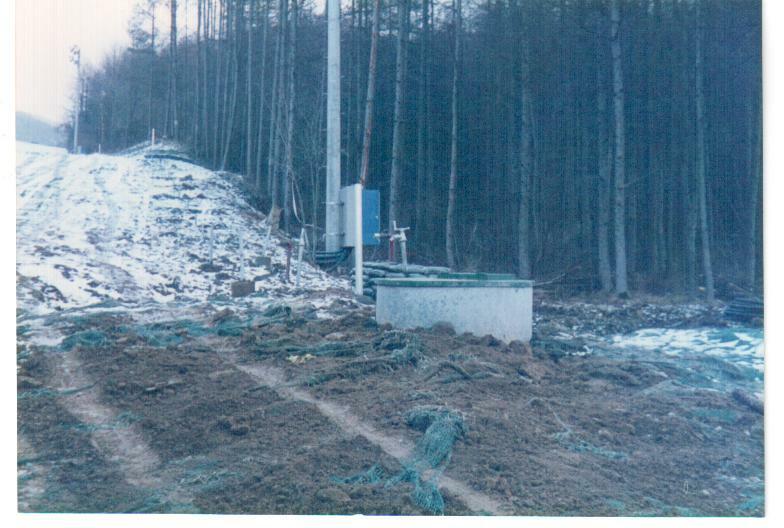 In order to accuracy calculation of AWR, Delta installed three weather stations at the Ski Area. One assembled AT(ambient temperature), RH(relative humidity), WS(wind speed) and WD(wind direction) at summit, one c/w AT, RH and BP(barometric pressure) at mid peak of MCB location and one c/w AT, RH for base area. Data logger collect all weather data wireless from the stations which has a WBT(wet bulb temperature) sensors and then directly communicate with host computer. The host computer analyzing weather data and convert accurate WBT for each auto hydrant. The local PLC sensing auto valve actuator as indicated CPU. As well the operational information store to the host computer for data base. Delta automatic hydrant and nozzle utilizes a pneumatic, spring return, fail safe valving system (see attached drawing). The fail safe feature, considered essential by Delta, is unique to the Delta design. In the event of power failure or difficulties with the compressed air system, the water valve in the auto hydrant will automatically close. This feature prevents accidental “icing” of the ski trails. The automatic hydrants are complete and include all valves, control system, electronics, piping, hoses, snowmaking nozzle and tower with space heater to prevent freezing auto valves. Delta auto hydrants no need to install underground because of specialized design of its self drain device. Delta automatic hydrant and nozzle utilizes a pneumatic, spring return, fail safe valving system. The fail safe feature, considered essential by Delta E&C, is unique to the Delta design. In the event of power failure or difficulties with the compressed air system, the water valve in the auto hydrant will automatically close. This feature prevents accidental “icing” of the ski trails. The automatic hydrant are complete and include all valves, control system, electronics, piping, hoses, snow-making nozzle and tower with space heater to prevent freezing auto valves. Delta auto hydrant no need to install under ground because of specialized design of its self drain device. In the case of fully automatic mode operation, additionally on the above needed automatic control air/water auto-hydrant module (herein after called “Auto Hydrant”)with power and communication wire networking with main control system in the MCB(Main Control Building). The Auto Hydrant consists in the prefabricated shelter with pneumatic control air/water valves, local PLC box for control, pneumatic control box for actuator control and one space heater to avoid of freezing water line in the cold weather. 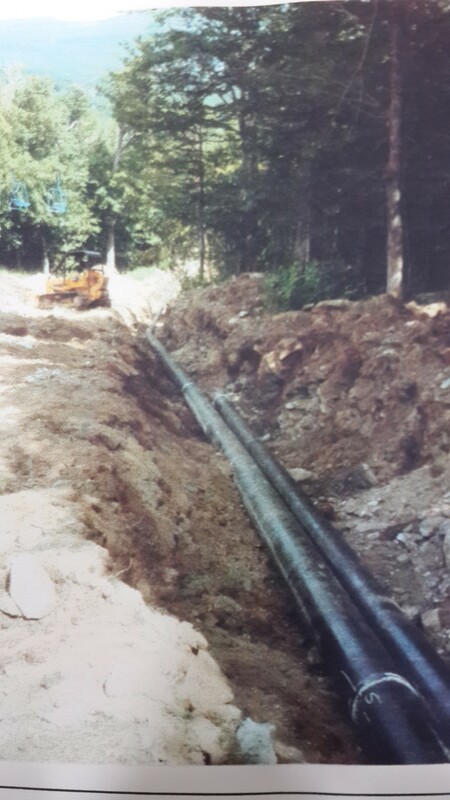 In addition, Delta’s specific design for self drain device will prevent freezing water in snowmaking hose and hydrant when snowmaking work is complete. The Delta semi automatic control mode could be convert to fully automatic mode easily at any time after construction hands off with just added Auto Hydrant module on the above ground level. If client have any intention to switch a fully automatic system from the semi automatic mode, In this case only needed to install power and communication wiring while initial construction period for future. As well as, the Auto Hydrant module simply detachable for maintenance by de-coupling connection port from the main air and water line. Delta has designed the method of auto hydrant connection to main air/water line apply quick coupler same type of snow hose connection to manual hydrant. The manual hydrant before the auto hydrant has two most important functions. 1st, it will set the same pressure at each auto-hydrant even the hydrant located different elevation, as the result, which will help to reduce costs for the valves and simplify to control accurate AWR only according to changes of WBT. 2nd, it will also help easy maintenance or changes by a quick disconnection if necessary. 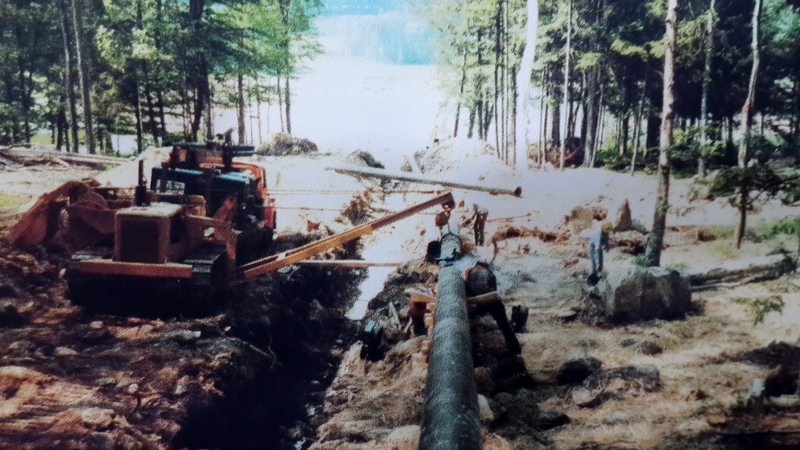 On the pipeline Delta recommends that air and water hydrants sets be installed every 50 meters to provide adequate coverage over the ski trails. 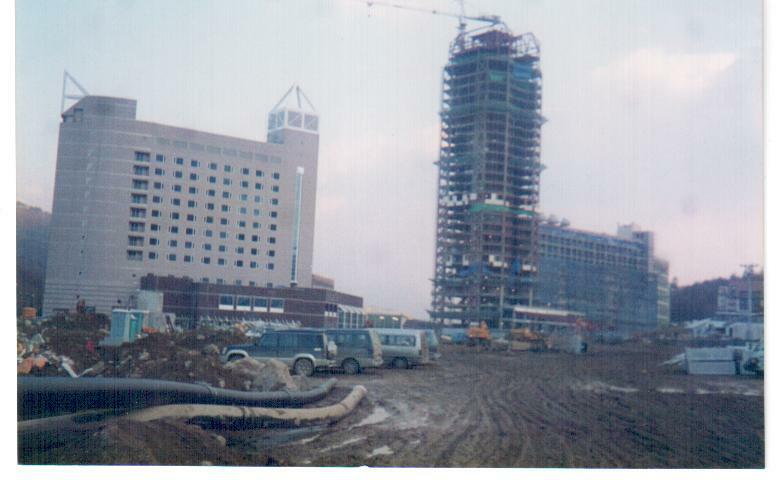 Note the spacing that can vary depending on the terrain, from as low as 40m to as high 50m. 50m spacing is adequate for the ski area where using 20ft Delta tower nozzles. Because as the weather condition changes as wind speed and wind direction, Delta designed lifting jack adjustable height angles and rotating as necessary. Normally the 20ft mini tower pile up the snow majority in the range of 10m up to 50m distance and more than 90 degree range wide spread. In the mode of semi automatic control, Delta will supply new generation of SnoforceTM pressure gauges with pager for the signal receiving of real time AWR(air water ratio). The pressure gauges are incorporated into an in line fitting that is mounted on the hydrant discharge port before the water hose. One fitting would be required for each nozzle, with an additional allowance for one fitting on every tenth air hydrant. As the nozzles treat water flow along the ambient temperature changes, snowmaker easily adjustable water flow according to indicates AWR from the computer utilizing with the fittings above. Delta does not normally express nozzle production performance versus temperature because of the following reason. 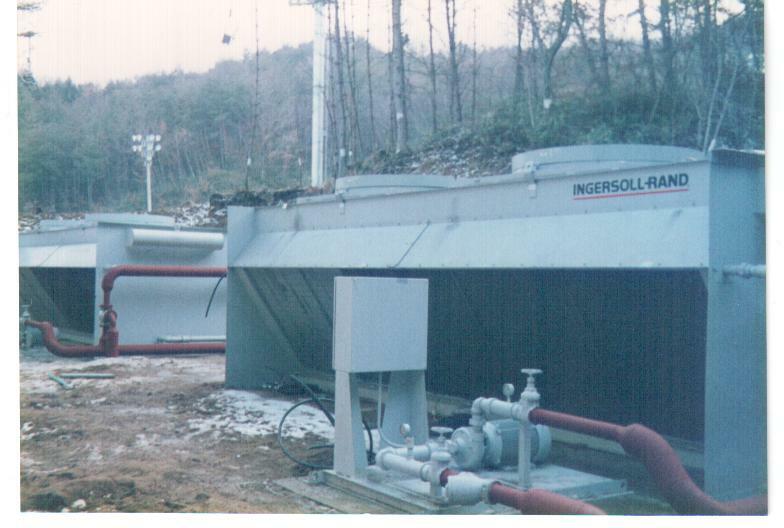 The snowmaking system’s performance should be examined rather than one nozzle’s performance. It is the ability of the snowmaking system to convert the maximum amount of water to snow at any given temperature using the least amount of compressed air that determines efficiency regardless of the number of snowmaking nozzles operating. In other words, how much air energy is used per m3 of water that is converted to snow, or at what AWR does the nozzle operate at any given temperature. This determine how much snow production versus energy consumption is required on a system basis. The key to any nozzle’s efficiency is how much air is used per unit volume of water that is converted to snow over a complete range of temperatures. The efficiency of nozzle is also the fundamental efficiency of the snowmaking system performance. This, however is not directly proportional to the nozzle snow production but to the efficiency or AWR. Delta also has an additional advantage apart from the lower air water ratios compared to the others. The unfrozen moisture content of snow produced by the Delta nozzles is only in the 5% range while the competitors nozzles range between 20 to 40% while airless equipment has up to 50% unfrozen moisture content. The question that should be asked is how much snow does each nozzle produce at what cost. It is important not to ignore the operating costs even if the capital costs to build the snowmaking system are higher. Lower overall AWR from the Delta nozzle. 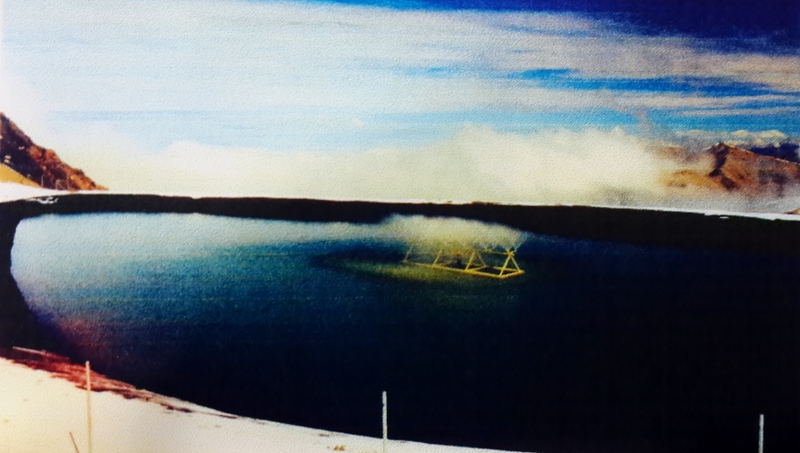 The higher air pressure that results in 40 to 50% improvement in overall snowmaking performance. 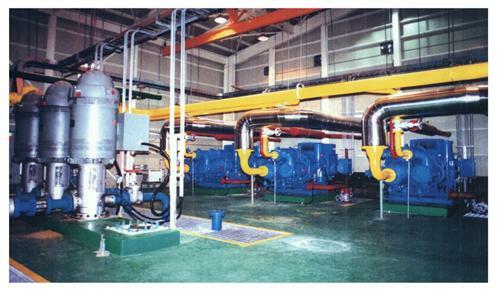 The optimizing of the system performance using the Delta Control system that pushes efficiency to the 90 to 95% range. The lower percentage of unfrozen moisture in the produced snow results in greater snow production using the Delta nozzle. The following example of nozzle production at various temperatures is approximately at 150psi air pressure. The basis of the system’s performance is the use of Delta four(4)-head air/water snowmaking tower nozzle mounting on 20ft mini tower alum body turret. The Delta tower nozzle is the most efficiency available on today’s market, as a result of Delta Industries dedication to continued research and development. For option one, the maximum number of nozzles operating at any one time will be recommended by the size of snowmaking plant. 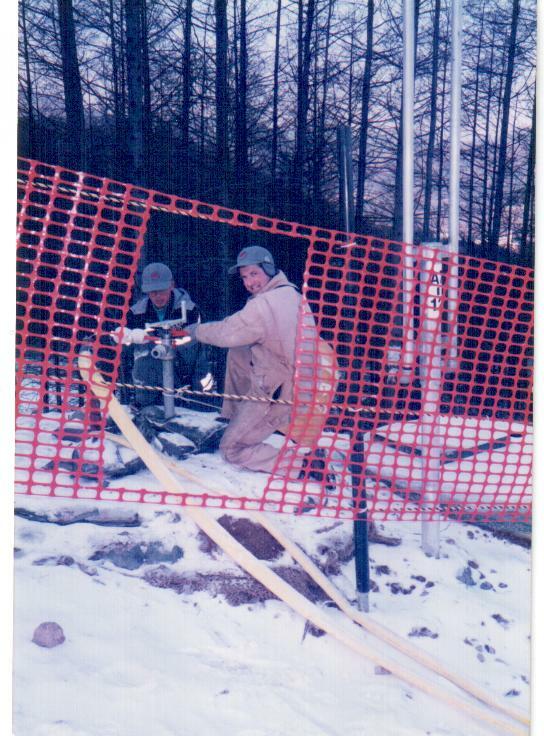 Those number of nozzles should be mounted on the movable mini tower sled to relocate to the snowmaking area. In this case, Delta recommends double sets of nozzles to reduce a loss of production time for relocate of nozzles to the next zone for snowmaking. For option two, Delta recommends additional sets of tower nozzles to be fixed permanently at base and summit area. The most skiers crowded in this area and it caused to melting the snow. So, where is the area needed snow recovery everyday. If fix the tower nozzle around this area, it will allow snowmaking staff to relocate the snowmaking operation without the loss of production time. It is why Delta recommends to fix the tower in this area. Patented specific designed nozzle head would available to change a different nozzle tips without any difficulties just using quick nozzle changer and also available to change 6 or 7 nozzles head. Delta would like recommend to use 6-head nozzles when making snow such a wide open base and/or summit area instead of fan-guns. This will be a great alternative saving capital cost for the customers.